General Hospital Spoilers: Margaux’s Connection To Dawn Of The Day – Is She Involved With Shiloh? 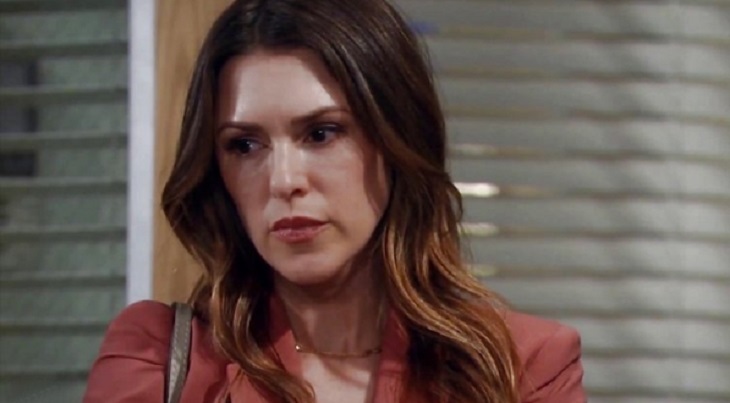 General Hospital spoilers tease that Margaux Dawson (Elizabeth Hendrickson) may be involved with Shiloh Archer (Coby Ryan McLaughlin) and the Dawn of Day cult, or at least on the verge of it! Observant General Hospital viewers spotted a copy of the Dawn of Day book in her purse in a recent episode, while she was in the police station as Franco Baldwin (Roger Howarth) was being arrested for the attack on Lulu Falconeri (Emme Rylan) and murders of Mary Pat Ingles (Patricia Bethune), Kiki Jerome (Hayley Erin) and Peyton Mills (John Patrick Jordan). Margaux’s bound to have some huge mommy and daddy wounds in her heart, after finding out through the efforts of Sonny Corinthos (Maurice Benard) that her mom was having an affair with Sonny’s boss, Joe Scully (Robert Miano) and ordered a hit on her dad! She never tried to prosecute her mother, but then it was out of her legal jurisdiction anyway, and the evidence was not collected legally either. General Hospital Rumors: Kevin Escapes From Ferncliff Who Will Believe He’s The Real Kevin? Margaux’s hitting rock bottom and feeling like her whole life was a lie makes her a prime recruit – or shall we say target – of Shiloh and the Dawn of Day cult! Perhaps she just has the book at this point after someone made a recruiting attempt, and she’s checking it out first before becoming any more involved with the group. Margaux probably feels the need to talk to somebody about what she’s been through and what she’s been feeling, but maybe not professionally. She’s not a churchgoer, so a pastor or priest wouldn’t be an option for her; and even if she was in the market for a psychiatrist, “Dr. Collins” would likely not take her on. After all, treating the district attorney may be a little too intimidating for even Ryan Chamberlain (Jon Lindstrom), and Dr. Neil Byrne (Joe Flanigan) appears to be new not only to Port Charles but to GH as well. Or, is Margaux one step ahead of everyone else and already investigating the group? Stay tuned to General Hospital and keep checking General Hospital spoilers frequently to see how Margaux ties in with the Dawn of Day cult and Shiloh Archer! Days of Our Lives Spoilers: Ben And Chad Team Up to Rescue Ciara – What About Baby Charlotte?